Barrie Trower is a former Royal Navy microwave weapons expert and former cold-war captured spy debriefer for the UK Intelligence Services. Mr. Trower is a whistle-blower, who lectures around the world on hidden dangers from microwave weapons and every-day microwave technologies such as mobile phones and Wi-Fi. Mr. Trower has also repeatedly assisted the UK Police Federation in their struggle to protect police officers from Tetra/Air-Band radio-communications systems that are harmful to health. This Saturday, Lost Arts Radio listeners have the rare privilege to listen in (and join in if time allows) on an impromptu conversation with microwave technologies and weapons expert Mr. Barrie Trower, on the dangers of wi-fi, smart meters, cell phones and other microwave devices and what you can do to protect yourself. Industries wanting to maximize their profits even at the expense of your health, and governments with their own agendas are not reliable sources of information on these subjects for obvious reasons, as well as some that may not be so obvious. Remember to mark this Saturday, April 4th at 6pm Pacific/9pm Eastern for a show that promises to be jam-packed with useful information you will not hear anywhere else. ” In the very early 1960’s I trained with the government microwave warfare establishment. I looked at all aspects of microwave warfare and when I finished my time in the military, because I had a lot of expertise in the microwave field, I was asked if I would carry on with this research. We are in a new Cold War and this is why countries are developing this. And this is why all the microwave transmitters are going up everywhere because somebody, if they wanted to, could use them for other effects. The system is up and running. section is included in the classified appendix.” A 16th volume, containing these and other classified materials, is not generally available. For more on EMFs and HPM for mind-control and other weapons applications, see MWN, J/F87, N/D93, J/F96 and S/O96. flak for being very wrong. Difficult, since it is really presumptuous to pretend that you have the vision to see the future. Nonetheless, you asked for it and here goes. intimately with hostile populations in situations where the application of nonlethal force will be the tactical or political preference. It appears likely that there are a number of physical agents that might actively, but largely benignly, interact or interfere with biological processes in an adversary in a manner that will provide our armed forces the tools to control these adversaries without extensive loss of life or property. These physical agents could include acoustic fields, optical fields, electromagnetic fields and combinations thereof. This paper will address only the prospect of physical regulation of biological processes using electromagnetic fields. with fewer artifacts and the principles underlying these interactions are becoming clearer and more amenable to theoretical prediction. and focused, that can couple with the human body in a fashion that will allow one to prevent voluntary muscular movements, control emotions (and thus actions), produce sleep, transmit suggestions, interfere with both short-term and long-term memory, produce an experience set and delete an experience set. 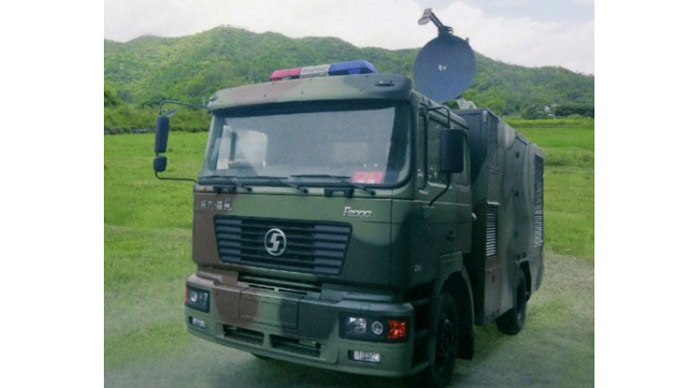 This will open the door for the development of some novel capabilities that can be used in armed conflict, in terrorist/hostage situations and in training. New weapons that offer the opportunity of control of an adversary without resorting to a lethal solution or to collateral casualties can be developed around this concept. modeled and tested in experimental preparations. Early testing using in vitro cell cultures of neural networks could provide a focus for more definitive intact animal testing. If successful, one could envision a weapon that would render an opponent incapable of taking any meaningful action involving any higher motor skills, (e.g. using weapons, operating tracking systems). The prospect of a weapon to accomplish this when targeted against an individual target is reasonable; the prospect of a weapon effective against a massed force would seem to be more remote. Use of such a device in an enclosed area against multiple targets(hostage situation) may be more difficult than an individual target system, but probably feasible. human body, raising the possibility of covert suggestion and psychological direction. When a high power microwave pulse in the GHz range strikes the human body, a very small temperature perturbation occurs. This is associated with a sudden expansion of the slightly heated tissue. This expansion is fast enough to produce an acoustic wave. If a pulse stream is used, it should be possible to create an internal acoustic field in the 5-15 kHz range, which is audible. Thus it may be possible to “talk” to selected adversaries in a fashion that would be most disturbing to them. highly exciting. Modern electromagnetic scattering theory raises the prospect that ultrashort pulse scattering through the human brain can result in reflected signals that can be used to construct a reliable estimate of the degree of central nervous system arousal. The concept behind this “remote EEG” is to scatter off of action potentials or ensembles of action potentials in major central nervous system tracts. Assuming we will understand how our skills are imprinted and recalled, it might be possible to take this concept one step further and duplicate the experience set in another individual. The prospect of providing a “been there-done that” knowledge base could provide a revolutionary change in our approach to specialized training. How this can be done or even if it can be done are significant unknowns. The impact of success would boggle the mind! Smart Meters Being Funded by the US Military? Was the US Military involved in ‘smart’ meter R&D? New documents suggest just that. 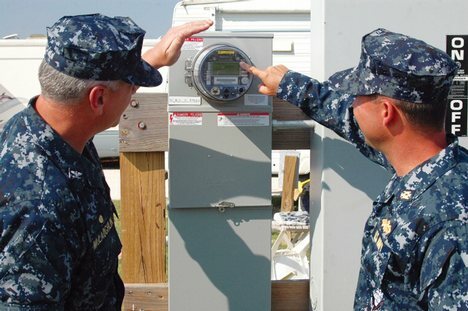 The utility companies have described their installation of ‘smart’ meters as a “deployment.” They have called those of us peacefully defending the safety and health of the public “insurgents.” At times, scenes of the public physically blocking military-style smart meter installations conjure up images of wartime. But is the smart meter program actually being funded by the military? Is the “smart grid” somehow linked with military research and development? That’s what documents unearthed and analyzed by Las Vegas activist and firebrand Angel de Fazio would seem to suggest. 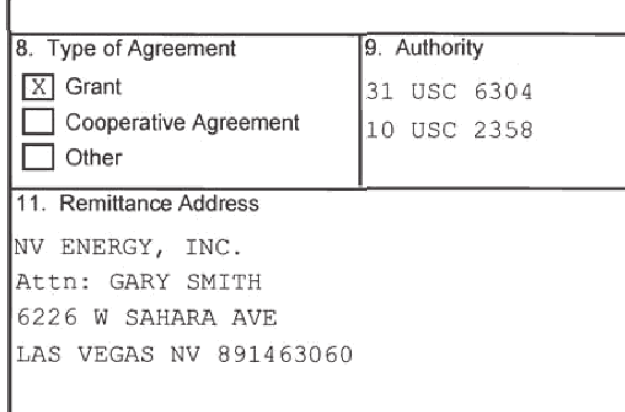 Now at StopSmartMeters.Org we’re not the first ones to call “conspiracy” at the slightest suspicion of impropriety. Yet this discovery raises important questions about the hasty and undemocratic smart meter installations, about the smart meters that have been spying on people and making thousands sick in their own homes from pulsed radiation. It’s become fairly clear to anyone involved in this fight- that this is not just simply a utility meter upgrade. There is more to these devices than meets the eye. 1. Last week the US Senate approved the National Defense Authorization Act which would allow the military to detain any US Citizen indefinitely without trial or charges within the United States. 2. Within the last month, the US Army has stationed an active unit on domestic duty within the United States- in order to deal with “civil unrest” and crowd control. 3. There is growing evidence that US Homeland Security helped to coordinate the brutal crackdowns on the Occupy encampments in major US cities over the past few weeks. Calls to the grant administrator were not returned. Photo – U.S. Marines outside the embassy in Havana in February. Diplomats working here reported strange noises and mysterious symptoms that doctors and scientists say may have resulted from strikes with microwave weapons.